Packed with antioxidants, barley grass juice contains a number of nutrients essential for your good health. It also helps restore a healthy acid-alkaline balance in your body. While barley grass juice provides numerous health benefits, including potential help for chronic conditions, consult your doctor before adding it to your diet. Barley grass juice may help ease symptoms associated with fibromyalgia. A chronic disorder, fibromyalgia is characterized by muscle pain, depression, inactivity and fatigue. A study published in “BMC Complementary and Alternative Medicine” in September 2001 found that the study participants who followed a raw, pure vegetarian diet for two months reported significant improvements in shoulder pain, flexibility and other fibromyalgia symptoms. The diet consisted of carrot juice, nuts, seeds, a dehydrated barley grass juice product, fruits, salads and grain products. Chlorophyll, a substance that gives barley grass its green color, may provide myriad health benefits. According to the book "Barley Grass Juice: Rejuvenation Elixir and Natural, Healthy Power Drink," chlorophyll is associated with improved wound healing and production of healthy blood cells. Furthermore, antioxidant nutrients found in chlorophyll protect against the damage wrought by free radicals -- toxic atoms or molecules that can destroy your healthy cells. Several studies suggest that diets rich in chlorophyll may help ward off certain diseases, reports an article published in "Academic Food Journal" in 2011. Barley grass juice contains vitamins A, C and K as well as some B vitamins. Vitamin A helps synthesize DNA and RNA. B vitamins help your body convert food into energy, while vitamin C helps combat free radicals. Folate helps reduce blood levels of a substance called homocysteine, high levels of which have been linked to increased risk of cardiovascular disease. Vitamin B-12 helps in the formation of healthy nerve tissues and blood cells. Your body uses vitamin K to clot blood. A study published in the 2002 issue of the journal “Diabetes and Metabolism” found that consuming powdered barley grass juice supplements can help boost your cardiovascular system. In the study, people with type-2 diabetes were given barley grass juice supplements, a combination of vitamins E and C or a combination of the two vitamins and barley grass regularly for four weeks. 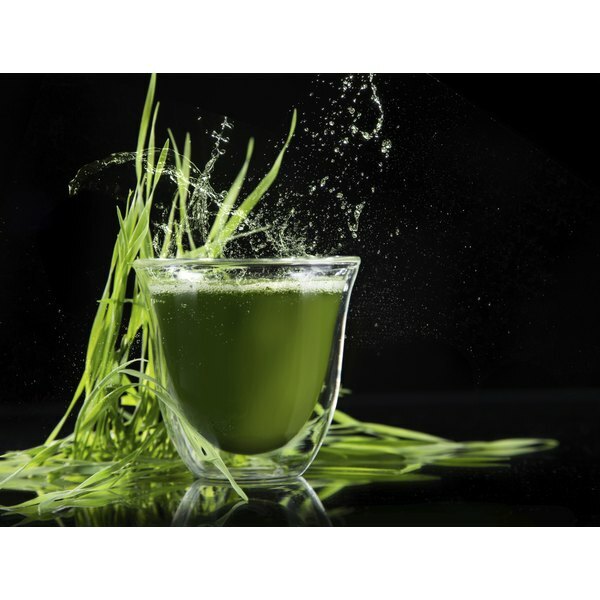 The researchers found that barley grass juice supplements lowered the levels of free radicals, total cholesterol and low-density-lipoprotein cholesterol. Moreover, barley grass, when taken with the two antioxidative vitamins, suppressed free radicals levels more effectively than either the vitamins or barley grass supplements taken alone. This led to the conclusion that barley grass juice supplements in combination with vitamins C and E may help promote cardiovascular health. Nutrition; Paul Insel et al.